Introducing the New Matsuko Switch box, an innovative range of external switch boxes ideal for controlling all types of electrical garden products. 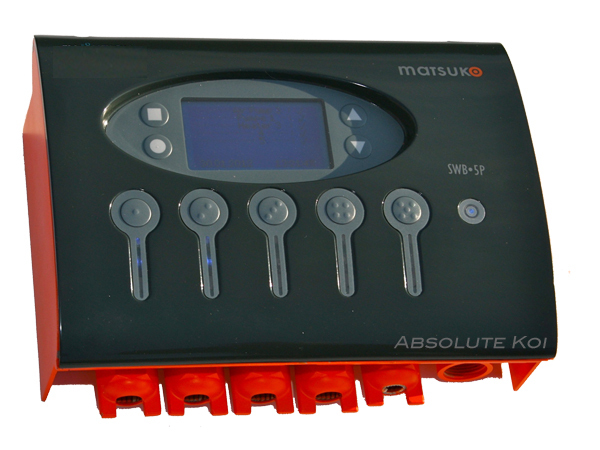 Matsuko switch boxes are ideal for controlling all types of electrical garden products. They allow a high level of flexibility and ease when it comes to controlling more than one appliance. For instance, you can easily have up to 5 appliances plugged in and controlled by the Matsuko switch box at any one time. Each outlet will take appliances of up to 1500 watts, with a total switchbox rating 7500 watts. Fully waterproof for use outdoors, complies with at least IP56 (to IP66 dependant upon installation method). The programmable models (SWB5P and SWB5PP) can be programmed to switch individual appliances on or off at chosen times of the day or night. Ideal for water gardening appliances like pond filters, airpumps, UV clarifiers, and water features. Switch boxes can be programmed to turn certain appliances on or off at certain times of the day. (Programmable models only). All models comply with UK legal and electrical safety standards. pump. If your pump operates outside of these parameters then PUMPGUARD will perform a series of checks to help prevent any damage to your pump. PLUS - Top of the range switchbox with PUMPGUARD also informs you of the power consumption going through the box. PumpGuardTM is a patent-pending, smart technology that helps to avoid possible disasters occurring when your pump blocks or overloads. Line 1 of every Matsuko switchbox with PumpGuardTM is set to automatically “learn” how the first pump that is connected to it behaves in normal use. Once the learning process is over (approximately after the first 20 min of running) PumpGuardTM goes into monitoring mode. It’s just looking out for your pump showing signs of overloading or cutting out, all day every day. PumpGuard also knows how long you’ve programmed your pump to run every day. So, if the pump should start to overload, or cut out, PumpGuardTM works on a series of recovery - “keep it going” - plans. PumpGuardTM’s program tries to keep the pump running but minimising the overload, or avoiding any cutting out, while still running as far as possible for the full programmed time during the day! As soon as an overload situation has occurred PumpGuardTM sounds a warning alarm (the signal for a warning alarm is a steady beeping sound plus a red LED on line No.1) the display shows “PumpGuardTM active”. A pump that constantly keeps restarting can easily burn itself out. PumpGuardTM detects this situation and will, if the cutting out cannot be stopped by running on a lower intensity program, disconnects the power. PumpGuardTM saves your pump from damaging itself. In this situation PumpGuardTM sounds a stop alarm (the signal for a stop alarm is a faster beeping sound plus a red LED on Line No. 1) and the display shows “Pump fail”. When you want to connect a new pump to your switchbox, you just reset PumpGuardTM on the control panel and the learning process will start again.